Is Amazon's knife sharp enough to carve into the tablet market? Is Amazon’s knife sharp enough to carve into the tablet market? There you are, sitting at a restaurant. You look over and see that the person next to you has ordered the roast duck. You see them carve off a succulent chunk of it and pop it into their mouth. It looks delicious so you order it yourself, salivating in anticipation. But when your duck arrives, you try to cut into it and your knife slides right off of the surface. You bear down as hard as you can and it barely makes a scratch in the surface. All the while, your neighbor is slicing off larger and larger bites and consuming them with glee. This is what the tablet market looks like today. Apple is munching up profits and market share, while most of its competitors seem confused as to how to even make a dent. But the landscape could be about to shift. Amazon is about to release a tablet. Yes, no formal announcement has been made, but enough industry signals are going off for us to be incredibly confident that we will see a tablet from the retail giant this holiday season, barring any major complications. With its first offering, Amazon is entering a market with incredible unrealized potential and a chance to plant its flag in soil made fertile by the iPad. But many challenges to Amazon’s offering taking root remain. Apple’s iPad represents an incredibly dominant incumbent contender. Existing tablets based on Android have so far sent forth only the tiniest shoots of success, despite seven months on the market. And Amazon’s hardware victories so far have come from mono-purpose Kindle devices with a much lower level of sophistication than most tablets. So, considering these challenges, should Amazon’s upcoming tablet be considered a minor threat, a category killer that threatens the dominance of the iPad or something in between? Amazon’s tablet has yet to be revealed in any formal capacity. This makes it difficult to conjecture about the exact form and specifications, but a recent report by MG Seigler lays out some basic ideas for us to work with. Seigler claims to have handled the actual tablet device that Amazon will be releasing, or at least a example that is close to a finished prototype. 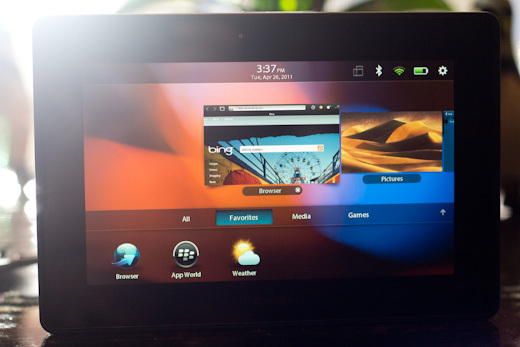 This tablet is a device with a 7″ screen that mimics the form of the BlackBerry PlayBook. While I was not impressed with much the PlayBook had to offer, I actually felt that the construction was one of the best things about it. Solid build, soft touch exterior and a nice comfortable size for a reader device make this comparison a favorable one for an upcoming Amazon tablet. The new device is also rumored to make some aggressive decisions to cut costs, like using a ‘two-finger touch’ screen instead of a ‘ten-finger touch’ screen like Apple uses in the iPad. These measures will reportedly allow Amazon to offer the ‘Kindle tablet’ at a $250 price point. Yes, these are things that we can’t be absolutely sure of, but they all fit with Amazon’s perceived strategy when it comes to devices and speak to a couple of strategic decisions. First, that they want the device to be comfortable to use as a portable content consumption tool, which the iPad, at times, struggles with as it is a heavier, and larger, device. And second, Amazon is positioning itself at a price in the market that is half of what the base model iPad sells for. This decision wasn’t made lightly, to be sure. But what does it mean about Amazon’s plans? Will Amazon be competing with the iPad? There has already been a significant amount of talk about Amazon’s upcoming tablet offering, and much of it has been centered around judging its performance against the 800lb market-smashing gorilla of the iPad. This is a huge mistake. There is no universe in which Amazon’s first tablet is competing directly with the iPad in the premium tablet market. Instead, it will be positioned as an alternative device, one that is significantly cheaper. Every other major manufacturer to release a tablet has thrown down the gauntlet right in Apple’s home territory. Not content to look for other opportunities, they have attempted to compete in the premium tablet space, head-to-head with the iPad. It’s difficult to explain this behavior rationally. Perhaps manufacturers that have dominated Apple for years in the PC space just assumed that they could do the same with tablets. But the fatal miscalculation here was that Apple created the tablet device as we know it today. Yes, tablets existed before, but the refinements and reductions that Apple applied to the old form are so dramatic that it has succeeded in generating a new class of device. One that it will be difficult for Amazon or anyone else to compete directly with. But that doesn’t mean that the Amazon tablet won’t be competing in mind share with the iPad. Because of its marketing prowess and its prominent status as a brand that consumers recognize, Amazon stands a very real chance of being the first Apple competitor to field a product that associates itself with the tablet market in a real way. “There is no tablet market, there is an iPad market.” The New York Times quote is a famous one now because it so accurately describes the single-minded focus of the tablet consumer in the current market. If people are out looking for a tablet, they’re generally out looking for an iPad first and foremost. I spoke with Glenn Fleishman, a freelance technology reporter who contributes regularly to The Economist and Macworld, about the advantages Amazon has over other would be contenders to the iPad. As an example, he related an anecdote about the day that Barnes & Noble launched its first foray into ecommerce. The bookseller was starting up its own online presence, instead of handing the reins right over to Amazon, as now-defunct competitor Borders would. This reliance on their own counsel has led Amazon to great success with the current Kindle as well. The first devices to hit the market weren’t the best, but the newest models have arguably become the archetypal ereader to most of the buying public. As Ritchie points out, Amazon’s store is one of the best examples of retail success online and it doesn’t just stop at its ability to sell hardware. Amazon also has the only other one-click system that rivals iTunes for content ease-of-purchase and the libraries of content to sell ready at its fingertips. While the content that it has available has largely been concentrated in the book and audiobook genres, it has also been building up a library of video and music content that, while not yet as extensive as Apple’s, could very well become so, especially with a focused outlet like a tablet. All of this existing online infrastructure serves to alleviate some of the pressure that other tablet makers have been under to find an outlet for their products. Although Amazon does not have a brick-and-mortar retail experience, it has one of the most extensive, and successful, online stores ever from which to pimp its wares. In addition to charting its own hardware paths, Amazon it is increasingly likely that the version of Android that it will use to power its tablet is not going to have much to do with Google at all. Instead, Amazon will be taking the open-source components that make up the core of the OS and will be rolling its own. This process, called forking, will have several consequences going forward. It does mean that Amazon will have a huge advantage in speed when it comes to getting its tablet off the ground. If a new OS was going to be created from scratch, we wouldn’t be seeing an Amazon tablet for some time yet. While the version of Android that Amazon will be using will share much of the Google version’s DNA, it will look and feel much different. This means that Amazon will be able to craft its OS experience as it sees fit and will not be beholden to Google for versioning, application support or fragmentation of its software across any future devices. But that doesn’t mean that the fork will be all upsides. There is also the question about Android providing, curating and growing its own version of the Android Market, the Amazon Appstore. I spoke to Gedeon Maheux, of The Iconfactory, the makers of apps like Twitteriffic and the cross-platform Frenzic. Maheux said that, due to its poor performance on the Android Market, they would be reluctant to offer Frenzic on an Android tablet first, but that the Amazon Appstore may provide some unique opportunities. Among those is the willingness and ability of Amazon customers to make purchases of digital content like apps. Millions of these are already accustomed to purchasing online using credit card numbers already on file with Amazon and primed for one-click. There are still enough variables, however, to cause them to be reluctant to devote resources to offering their apps right at launch. The Android Market hasn’t traditionally been all that friendly to paid apps and if that trend continues to prevail on Amazon’s store, then it might have a hard time convincing developers that they need to offer their wares for the Amazon tablet. this probably won’t affect the initial launch of the tablet, because the focus will likely be on the content that Amazon will allow its users to access there. But at some point it is going to have to prove that it is a fertile ground for developers or risk platform stagnation. Amazon has some definite challenges ahead, even beyond enticing developers to its platform. For one, they have an issue offering content outside of the US due to content licensing and other regional issues. Their content only recently became available in Spain and much of it remains inaccessible to Canada and other regions. But the fact remains that the tablet market is enormous and growing every year. Apple is on track to sell more than 45 million iPads this year alone and its competitors have yet to sell more than — and this is being generous — a few million of any single tablet device. Yes, Apple owns the market for the iPad, but there is a huge secondary market, which is exactly where Amazon looks to be aiming its product. Remember that Amazon’s strategy is — and always will be — wildly different from Apple’s in that it does not make money off of hardware, it makes it off of selling content. For better or for worse, Amazon is not a premium device company. Once it has established a tablet, or a series of tablets, you can bet that it will be a race to the bottom when it comes to price. An Amazon tablet for $150 with special offers? We could be seeing such a beast sooner than you think. He goes on to point out, correctly I believe, that the 100+ million accounts tied into the iTunes Store by the time that the iPad was released was a core component of its success as a platform. Users already had apps for the device, or the ability to purchase them easily, and could fire them up and begin buying and installing them right away. There is simply no other competitor with all of the deals in place to deliver books, movies, music and more and the millions of users accounts primed to purchase them. Amazon also has experience in producing workaday hardware that, while not very attractive, works well and resonates with the consumer. And its retail arm has easily the longest reach online, with hundreds of millions of visitors a year passing through its virtual doors, just waiting to be pitched the new tablet. It seems obvious, taking these things into consideration, that Amazon has a clear chance here to become a solid contender that sweeps the middle of the market, cutting into the choice meat of the number two spot, rather than fighting it out with Apple for a premium slice.